Click on the below pages to read post IIFA highlights. Ustad Rahat Fateh Ali Khan’s music will be highlighted at the Magic of the Movies and Technical Awards on Friday, April 25 at MidFlorida Credit Union Amphitheatre. Other entertainers for the evening include, Farhan Akhtar, Aditi Rao Hydari, and Shruti Hassan joining Bhoomi Trivedi, Monali Thakur, Ravi Drums and Ankit Tiwari in performances paying a tribute to the soul of Indian films. Organizers announced that triple nominee, Deepika Padukone, will be one of the performers on awards night April 26 at Raymond James Stadium. Balan later made an appearance at Eat at Joe’s lunch and concert party at Chillura Courthouse Square Park in downtown, where well over a 100 fans had gathered to catch a glimpse of the award-winning superstar. See the IIFA special section above for our interview with the talented actress. Khaas Baat attended the IIFA press conference at the U.S. Consulate in Mumbai in February promoting the upcoming Weekend and Awards in Tampa Bay on April 24-26. Madhuri Dixit-Nene, Kareena Kapoor Khan, Hrithik Roshan, Bipasha Basu and Ranveer Singh join the previously announced artists scheduled to perform, which include Shah Rukh Khan, Priyanka Chopra, Sonakshi Sinha, Pritam and Yo Yo Honey Singh. Shiamak Davar will be choreographing the performances. Saif Ali Khan who will be hosting the Technical Awards on April 25. Pritam is planning a special fusion musical performance. Farhan Akhtar and Shahid Kapoor are hosts for the main event. The delegation from Tampa included Mayor Bob Buckhorn, Hillsborough County Commissioner Al Higginbotham, Visit Tampa Bay president Santiago Corrada and IIFA hosts Drs. Kiran and Pallavi Patel. IIFA Stomp on April 23 at Curtis Hixon Waterfront Park in Tampa will feature Tampa native, DJ Ravi Drums, and Akbar Sami. The free public event will be a celebration of music, dance and cuisine. An additional special attraction is IIFA Film Masterclass with Vidya Balan and Hollywood actor Kevin Spacey on April 26. A huge celebrity contingent will fly in to Tampa for the IIFA Weekend and Awards, including Deepika Padukone, Sridevi and Boney Kapoor, Karan Johar, Shabana Azmi, Javed Akhtar, Rakeysh Om Prakash Mehra, Irfan Khan, Kamal Hassan, Rakesh Roshan, Rishi Kapoor, Shreya Ghoshal, Shekhar Kapoor, Shruti Hassan, Anil Kapoor, Anupam Kher, Vidya Balan, Ritesh Deshmukh, Genelia D’souza, Boman Irani, Fardeen Khan and many others. Superstars Vidya Balan and Saif Ali Khan will join IIFA for a promotional tour in March visiting New York, Houston, Tampa and Orlando. 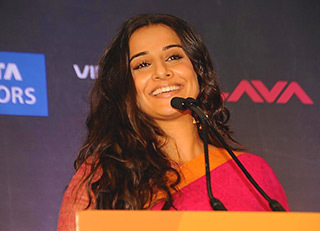 Vidya Balan is expected in Tampa and Orlando on March 14. Shah Rukh Khan (Chennai Express), Hrithik Roshan (Krrish 3), Ranbir Kapoor (Yeh Jawaani Hai Deewaani), Farhan Akhtar (Bhaag Milkha Bhaag), Ranveer Singh (Goliyon Ki Rasleela-Ramleela) and Sushant Singh Rajput (Kai Po Che) are nominated for Performance in a Leading Role (Male) for exceptional work in their respective films. Stealing the limelight with three nominations for Performance in a Leading Role (Female) category is Deepika Padukone for her work in last year’s hits Chennai Express, Goliyon Ki Rasleela- Ramleela and Yeh Jawaani Hai Deewaani. Joining her in that category are Sonakshi Sinha (Lootera), Nimrat Kaur (The Lunchbox) and Shraddha Kapoor (Aashiqui 2). Best Director nominees are celebrated filmmakers Sanjay Leela Bhansali, Rakesh Roshan, Rohit Shetty, Rakeysh Omprakash Mehra and Abhishek Kapoor. The Best Film category includes the most successful films of 2013, Dhoom 3, Yeh Jawaani Hai Deewani, Goliyon Ki Rasleela-Ramleela, Krrish 3, Kai Po Che, Chennai Express and Bhaag Milkha Bhaag, competing to win the coveted title. 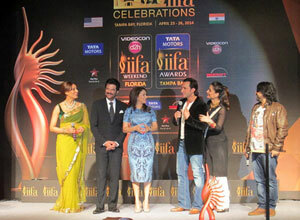 Winners of the technical categories of IIFA awards have been announced. Leading the race is “Bhaag Milkha Bhaag” with nine wins, including Best Cinematography (Binod Pradhan), Best Screenplay (Prasoon Joshi), Best Dialogue (Prasoon Joshi), Best Editing (P. S.Bharti), Best Sound Design (Nakul Kamte ), Best Sound Mixing (Pranav Shukla), Best Background Score (Shankar-Ehsaan- Loy), Best Costume Designing (Dolly Ahluwalia), and Best Make-Up (Vikram Gaikwad). Technical award winners will be recognized at the IIFA Magic of the Movies and Technical Awards on April 25 at the MidFlorida Credit Union Amphitheatre. Tickets for this event will be on sale on Ticketmaster by mid-March. Priyanka Chopra kicks off IIFA Tampa 2014 celebrations. For the doubters who asked why Tampa, “Why not Tampa?” was the common sentiment by the contingent. Actors Anil Kapoor and Priyanka Chopra were in Tampa as part of their three-city tour, including Los Angeles and New York, to promote IIFA Tampa 2014 celebrations. After all, the west coast Florida city has hosted five Super Bowls, last year’s Republican National Convention during a hurricane threat and the Stanley Cup with tremendous success. The historic downtown Tampa Theatre. 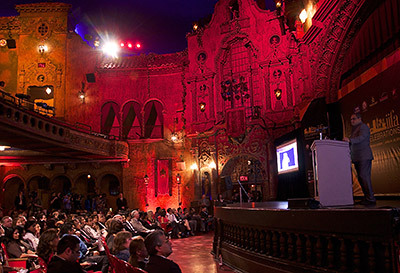 The historic Tampa Theatre in downtown was the venue for the International Indian Film Academy (IIFA) awards kickoff celebrations. 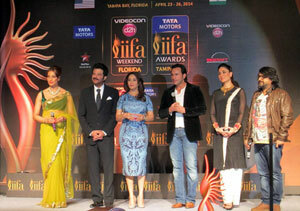 The IIFA Weekend & Awards will be April 24-26 in Tampa. The press meet was attended by Hillsborough County Commissioner Al Higginbotham, Indian Consul General Ajit Kumar, Visit Tampa Bay CEO Santiago Corrada, Tampa Host Committee Chair Dr. Kiran Patel and IIFA management. Corrada said the journey of bringing IIFA to Tampa started eight months ago and has taken 15 years to arrive in the United States. “We have a huge responsibility. 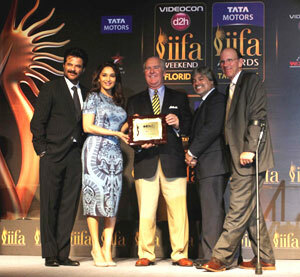 Thank you IIFA for bestowing a great gift on our community,” he said. Later that evening, the two stars visited the University of South Florida campus for a special tree-planting ceremony at the Patel College of Global Sustainability where they were greeted by hundreds of cheering fans. IIFA with its trademark Green Carpet shares the Patel College’s vision and commitment to sustainability. USF President Judy Genshaft and the college Dean Kala Vairavamoorthy thanked them for visiting the university. Ahead of the three-day event, the city can look forward to “IIFA Stomp” on April 23 at Curtis Hixon Waterfront Park in downtown. The free Bollywood party will be open to the public. Priyanka Chopra and Anil Kapoor. IIFA revealed that the 15th annual awards will be co-hosted by Farhan Akhtar and Shahid Kapoor. Other confirmed performers are Shah Rukh Khan, Priyanka Chopra, Sonakshi Sinha, Pritam and Yo Yo Honey Singh. Other star attendees will be announced in the coming weeks. As of press time, tickets for the IIFA Awards night on April 26 are more than 70 percent sold and available on Ticketmaster. Organizers have announced that tickets for the IIFA Magic of the Movies & Technical Awards on April 25, a night of music and performances, at the MidFlorida Credit Union Amphitheatre are expected to go on sale this month. Last summer, it was announced that Tampa would be the venue for the International Indian Film Academy (IIFA) Weekend & Awards in 2014 leading to much excitement for Indian film lovers in Florida. After much anticipation, the dates and itinerary were made public: April 24-26. IIFA will be making its debut in the United States where fans and enthusiasts of Indian cinema from around the world can expect to see their favorite stars descend into Tampa during the weekend and witness one of Indian Cinema's largest events unfold in the city. A tremendous demand for tickets is expected and played a part in venue selections. Thursday, April 24, and Friday, April 25, there will be an IIFA Global Business Forum at Tampa Convention Center. Thursday evening is the IIFA Rocks concert at the Tampa Convention Center. Friday night, the IIFA Magic of the Movies & Technical Awards will be held at MidFlorida Credit Union Amphitheatre. The main event, IIFA Awards, will be on Saturday, April 26, at Raymond James Stadium. Earlier this year, key delegates from Visit Tampa Bay, including Santiago Corrada (president and CEO of Visit Tampa Bay) travelled to Mumbai and New Delhi to forge crucial ties in India with IIFA before the event in April. Corrada and IIFA officials discussed many details, anticipating special arrangements that needing to be addressed to host India’s celebrated dignitaries, business leaders and Bollywood’s A-list celebrities. 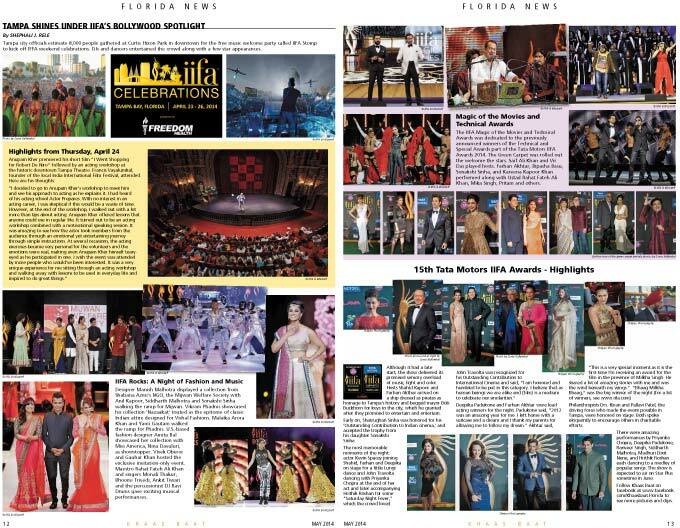 Organizers say with world-class infrastructure and facilities and having hosted a myriad of international concerts, events and the Super Bowl four times, Tampa Bay is an ideal choice for the 15th IIFA Weekend & Awards. Corrada of Visit Tampa Bay said, "We are extremely excited to join Wizcraft/IIFA in announcing the official dates, venues… Our teams have worked together diligently over the past six months to ensure a successful production in Tampa Bay. Our entire region is enthusiastically preparing to welcome tens of thousands of visitors to our destination, and we look forward to serving as great hosts to the biggest and best International Indian Film Academy awards in history." Having played a large hand to bring the IIFA ceremony to Tampa Bay, the cardiologist, philanthropist, community leader and strong supporter of IIFA, Dr. Kiran Patel was instrumental in bringing the Indian community together in Florida and specifically Tampa, to support cinema and IIFA. And the next question on everyone’s mind, how to get tickets. A multi-city press conference is expected in mid-January to reveal the ticket sale information. Join us on facebook or visit www.khaasbaat.com for the latest details as they are announced.